A central tenet of the current understanding of the relationship between Ab structure and function is that the variable region domain is solely responsible for Ag specificity. However, this view was recently challenged by the observation that families of mouse-human chimeric Abs with identical V regions demonstrate differences in fine specificity and by reports of changes in Ab Id structure with isotype switching. Here we revisited this question by evaluating the reactivity of two families of murine IgG switch variants that differed in V region usage for Cryptococcus neoformans glucuronoxylomannan, glucuronoxylomannan peptide mimetics, and anti-Id mAbs. The results reveal isotype-related differences in fine specificities and Id for two mAb isotype switched families, thus establishing the validity of this observation with sets of homologous Abs. The results suggest that the C region affects V region protein conformation, leading to differences in fine specificity and Id. The finding that isotype can affect fine specificity has major implications for current concepts of the generation of secondary responses, idiotypic network regulation, and isotype function. Given that isotype class switching and Ig gene somatic hypermutation share molecular mechanisms, these observations unify these processes in the sense that both can alter specificity and affinity. The current understanding in immunology is that the interactions between V region amino acids and the cognate Ag define Ab specificity. This concept originates from the observation in the 1960s that Ab diversity arises from VDJ recombination, somatic mutations in the CDR regions of the V gene, and class switch recombination (1, 2). A number of studies over the past three decades, including x-ray crystal diffraction studies (3), have validated this principle. However, several recent observations strongly suggest that for certain Ag-Ab combinations, the C region can affect the specificity of the interactions between the Ab-binding site and Ag (4, 5). Cooper and colleagues (5) identified a family of mouse hybridoma switch variants that bound the GlcNac residues of the cell wall polysaccharide of group A streptococci. These Abs had identical V region sequences, yet the magnitude of binding to GlcNAc differed for each isotype (5). Although some aspects of this phenomenon probably reflected changes in avidity, an explanation based on changes in specificity was not formally excluded. Another observation suggesting that the C region could affect some aspects of the V region structure was the report that immunogenic Id-Abs acquired tolerogenicity by switching to IgG1, IgG2a, IgG2b, IgG3, and pIgA (6). These Abs regained their immunogenicity when the Fc portion of IgG1 was removed and switched to IgE or monomeric IgA. That finding was interpreted as suggesting that V regions expressed with IgG or pIgA negatively control the immune response to shared Ids (7). Additional support for the concept that C region can affect V region structure came from studies with the cell line SAMM 368, which produces IgG2b and IgA Abs with specificity for the same Ag, without sharing idiotypic determinants (8). Furthermore, certain mouse idiotypic determinants have been associated with the serum IgA fraction, suggesting that some Ids are isotype restricted (9). Although Id isotype restriction could represent the preferential associations of certain V regions with certain C regions, it could also imply that certain isotypes affect V region conformation (9). We have recently reported a family of mouse-human chimeric Abs that bind to the Cryptococcus neoformans glucuronoxylomannan (GXM)4 polysaccharide. Despite having identical V regions, the IgM and IgG3 chimeras had altered fine specificity compared with the IgG1, IgG2, IgG4, and IgA chimeras as measured by several serological assays (10). Idiotypic studies using mAbs revealed differences in reactivity with chimeric Abs expressing the same V region with different C regions. These results were interpreted as indicative of fine specificity changes originating from differences in isotype, possibly as a result of differences in the folding and exposure of antigenic epitopes of the V region (10). Because chimeric Ab synthesis involves joining of V and C region sequences from two species we could not exclude the possibility that this unusual finding was a result of creating an artificial molecule. Given the finding that the C region can affect V region fine specificity and Id might have major implications for several current immunological concepts, and that none of the observations suggesting this view are conclusive, we have investigated this problem further by comparing the fine specificity of two families of murine IgG switch variants, 3E5 and 4H3, that bind to C. neoformans GXM polysaccharide. mAbs 3E5 and 4H3 both bind GXM, but each differ in specificity and V region usage (11). mAb 3E5 IgG3 (11, 12), which was generated from a B cell isolated from a mouse immunized with GXM-tetanus toxoid, uses VH7183 and VK 5.1 gene elements and binds to an epitope found in all serotypes of GXM (13). The murine Ab response to GXM is highly restricted because the majority of mAbs to GXM that were isolated either from infected mice or from mice immunized with GXM-tetanus toxoid (11) are encoded by VH7183. Administration of mAbs 3E5 IgG1, IgG2a, and IgG2b diminished the fungal burden and prolonged the life of lethally infected mice, whereas 3E5 IgG3 was not protective (14). The difference between 3E5 IgG3 and the other 3E5 mAbs was believed to have been FcR mediated (15), because their V regions were sequenced and shown to be identical (11) and the efficacy of the different isotypes was modified in mice genetically defective for some FcR (16). mAb 4H3 IgG3, which was generated from a B cell isolated from a mouse infected with C. neoformans, uses VH441 and Vλ1 gene elements (11) and binds a different epitope of GXM than that recognized by mAb 3E5. None of the 4H3 isotype variants are protective in mice (15), and some even enhance infection (16). Our results demonstrate difference in binding and Id recognition for V-region-identical IgGs that are consistent with the notion that isotype contributes to Ab fine specificity for certain Ags. GXM-binding mAbs 3E5, 4H3, and 12A1 have been previously described (17, 18). The IgG1, IgG2a, and IgG2b switch variants of mAbs 3E5 were generated in vitro by sib selection (19). The IgG1 and IgG2b switch variants of mAb 4H3 were isolated in vitro by sib selection (12). The V regions of the 3E5 and 4H3 family have been sequenced and shown to be identical (11, 12). mAbs 3E5 and 12A1 are encoded by VH 7183 and VK 5.1(17), and based on the use of the same variable gene elements and shared Id (20), these Abs have been classified as members of class II mAbs to GXM. mAb 4H3 is encoded by VH 441 and Vλ2 (11). mAb 6A10 is an anti-idiotypic Ab that binds the combining site of class II mAbs, as has been previously described (21). As a negative control mouse mAb MOPC 21 (mIgG1) (Sigma-Aldrich) was used. All IgG1 mAbs were purified from hybridoma supernatants using protein G columns (Pierce) following the manufacturer’s instructions. All non-IgG1 mAbs were purified using protein A (Pierce) following the manufacturer’s instructions. Next, the purified mAbs were dialyzed against PBS and concentration was determined by ELISA using isotype matched standards. The 3E5 family of switch variant immunoglobulins was analyzed by MALDI-TOF mass spectrometry at the Laboratory for Macromolecular Analysis at Albert Einstein College of Medicine (Bronx, NY), to evaluate for the presence of aggregates. The MALDI-TOF mass spectrometry analysis revealed no evidence of IgG aggregation. RNA was isolated from hybridoma cells using TRIzol reagent (Invitrogen Life Technologies). cDNA was generated using SensiScript RT kit from Qiagen. For mAbs 3E5 IgG1 and IgG2a, DNA containing the VH was amplified using specific sense and antisense primers as follows: 5′-GGGGCCAGTGGATACAC and 5′-GAAGTGAAGCTGGTGGAGTC. The cDNA template was then amplified using the PCR Core Kit (Qiagen) with 3.0 mM Mg2+ and 0.5 μM of each primer under the following conditions: initial denaturation at 94°C for 3 min, 94°C for 1 min, 52°C for 1 min, and 72°C for 1 min for 30 cycles, followed by a final 10-min extension at 72°C. For mAb 3E5 IgG2b the following primers were used: 5′-VHUni, 5′-TGAGGTGCAGCTGGAGGAGTC and 3′-msCγ, 5′-AGACCGATGGGGCTGTTGTTTTGGC (22). The cDNA template was then amplified using the PCR Core Kit (Qiagen) with 0.5 μM of each primer under the following conditions: initial denaturation at 94°C for 3 min, 94°C for 1 min, 60°C for 1 min, and 72°C for 1 min for 40 cycles, followed by a final 10-min extension at 72°C. DNA containing the VL of 3E5 IgG1, IgG2a, and IgG3 mAbs was amplified using the sense and antisense primers Vk5.1, 5′-GATGTTGTGATGACCCAA and Vk, 5′-TGGATGGTGGGAAGATG (12). The cDNA template was then amplified using the PCR Core Kit (Qiagen) with 3.0 mM Mg2+ and 0.5 μM of each primer under the following conditions: initial denaturation at 94°C for 3 min, 94°C for 1 min, 48°C for 1 min, and 72°C for 1 min for 30 cycles, followed by a final 10-min extension at 72°C. For 4H3 IgG1, IgG2b, and IgG3 mAbs, DNA containing the VH was amplified using the sense and antisense primers as follows: 4H3VH, 5′-AAGTAGCCTTTGACAAGGCA and 4H3VH3′, 5′-GAGGTGAAGCTTCTCGAGTCT (11). The cDNA template was then amplified using the PCR Core Kit (Qiagen) with 3.5 mM Mg2+ and 0.5 μM of each primer under the following conditions: initial denaturation at 94°C for 3 min, 94°C for 30 s, 46°C for 1 min, and 72°C for 1 min for 30 cycles, followed by a final 10-min extension at 72°C. The cDNA encoding the VL domains of 4H3 IgG1, IgG2b, and IgG3 hybridomas Ig was generated by PCR with specific sense and antisense primers as follows: 5′-CCCAGCCCATACTAAGAGTTAT and 5′-CTCAATGATTCTATGTTGTGCC. The cDNA template was then amplified using the PCR Core Kit (Qiagen) with 3.5 mM Mg2+ and 0.5 μM of each primer under the following conditions: initial denaturation at 94°C for 3 min, 94°C for 30 s, 46°C for 1 min, and 72°C for 1 min for 30 cycles, followed by a final 10-min extension at 72°C. Purified PCR products by QIAQuick Gel Extraction kit (Qiagen) were then sequenced bidirectionally by automated gel sequencing (DNA Sequencing Facility, Albert Einstein College of Medicine). GXM was purified from Cryptococcus neoformans culture by cetyltrimethylammonium bromide precipitation, as described elsewhere (23). The serotype D C. neoformans strain 24067 from the American Type Culture Collection was used for all experiments. The GXM solution was tested for detectable protein contaminants, after which it was lyophilized and resuspended in sterile saline to a 5 mg/ml solution. O-Acetyl groups were removed from GXM prepared from C. neoformans serotype D, American Type Culture Collection strain 24067 by treatment with NH4OH (pH 11.25–11.50) for 24 h at room temperature. De-O-acetylated GXM was recovered by lyophilization and resuspended in sterile saline (24). Keyhole limpet hemocyanin (KLH) (3 mg; Pierce) was dissolved in PBS, and then treated with gluteraldehyde (KLH-g), as described (25). The reaction was incubated overnight at room temperature on an end-over-end rocker and then dialyzed (Slide-A-Lyzer MWCO 10,000; Pierce) at 4°C against sterile PBS for 3 days with daily changes. Periodate-treated KLH (KLH-p) was generated by treating KLH with 0.2 M sodium periodate (Sigma-Aldrich) in 0.01 M sodium acetate buffer (pH 4.5) overnight at 4°C (26). The reaction was stopped by the addition of an equal volume of 0.05 M sodium borohydride (Sigma-Aldrich) for 30 min at room temperature. KLH-p was then dialyzed against sterile PBS for 48 h with daily changes as described (27). Ab binding to GXM, de-O-acetylated GXM, KLH-g, and KLH-p was measured by ELISA, as described (15). Briefly, the ELISA plates were coated with 50 μl of a solution of 10 μg/ml Ag. The plates were incubated for 1.5 h at 37°C, and then overnight at 4°C with 1% BSA/TBS. Serial dilutions of Ab were incubated on the plates and detected with phosphatase-conjugated goat anti-mouse L chain (κ or λ) (Southern Biotechnology). The plates were then developed by adding substrate and determining OD at 405 nm. Competition ELISAs were done as described previously (12). Briefly, polystyrene plates were coated with 50 μl of a solution of 10 μg/ml GXM in PBS followed by blocking with 1% BSA in TBS. Then, 3E5 mAbs were added and serially diluted followed immediately by the addition of mAb 12A1 (IgM) (final concentration, 2 μg/ml). Plates were incubated overnight at 4°C, and binding of mAbs was determined with alkaline-phosphatase conjugated goat anti-mouse IgM. The plates were then developed by adding substrate and determining OD at 405 nm. 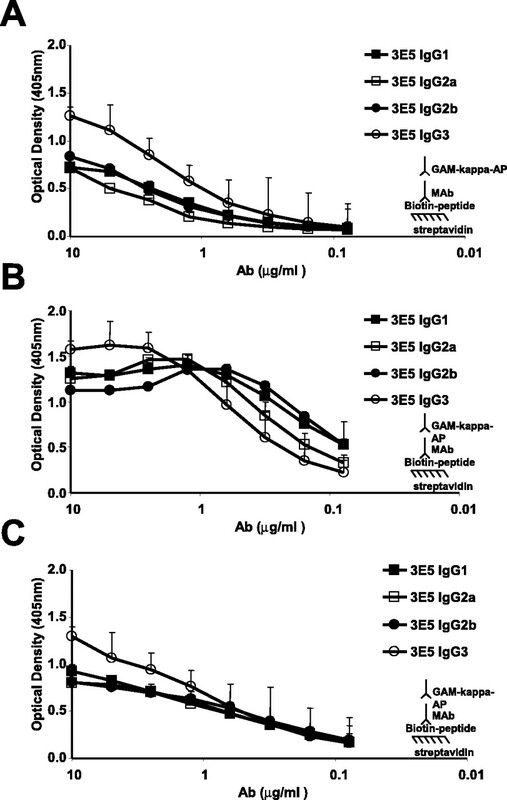 Reactivity of 3E5 mAbs with the murine anti-idiotypic mAb 6A10 (IgG1) was also measured by ELISA. The anti-idiotypic mAb 6A10 binds to the Ag-combining site of class II mAbs (21). Plates were coated with mAbs 3E5 serially diluted in PBS, and then blocked with 1% BSA in TBS. The plates were then incubated with biotinylated 6A10 mAb, and developed with Vectastain ABC kit (Vector Laboratories). mAb 6A10 was biotinylated using the EZ-Link NHS-PEO solid phase biotinylation kit from Pierce, following the manufacturer’s instructions. 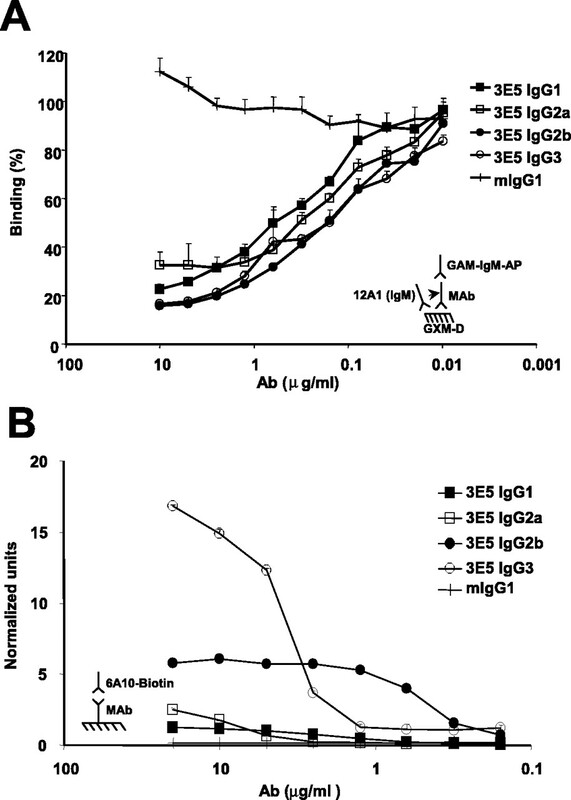 As a control for the amount of 3E5 IgG subclass bound to the plate, the same ELISA was done using an alkaline phosphatase-conjugated anti-mouse κ Ab (Southern Biotechnology) instead of the biotinylated 6A10 mAb. This ELISA revealed differences in the binding of the various isotypes to the polystyrene matrix. To normalize the data for differences in binding, we measured the relative amount of each 3E5 IgG subclass mAbs bound to the plate using anti-mouse κ Ab. The IgG subclass with the lowest concentration in the plate was assigned a value of one, and the concentration of the other IgG subclasses was normalized relative to this number. Polystyrene plates were coated with a 1 μg/ml solution of streptavidin (Sigma-Aldrich) in PBS followed by blocking with 1% BSA in TBS. Biotinylated peptide was then added at 2 μg/ml. The peptides PA1 (LQYTPSWMLV), P601E (SGSGDSYSWMYEA), and P206.1 (FGGETFTPDWMMEVAIDNE) are mimetics of GXM (28, 29, 30). The peptides were biotinylated and synthesized by the Laboratory for Macromolecular Analysis at Albert Einstein College of Medicine. mAb 3E5 was added in serial dilutions and specific binding was detected using phosphatase conjugated goat anti-mouse κ Ab (Southern Biotechnology). The plates were then developed by adding substrate and determining OD at 405 nm. A suspension of 106 C. neoformans 24067 cells per millilter was incubated for 30 min at 37°C with 2% BSA (ICN Biomedicals) and 0.5% goat serum (Sigma-Aldrich). mAbs 3E5 or 4H3 or control mAbs were then added at 20 μg/ml in 2% BSA and 0.5% goat serum, and incubated for 1 h at 37°C. Binding of primary mAb was detected by adding FITC-labeled goat anti-mouse IgG (H + L; Southern Biotechnology) at 10 μg/ml. To distinguish the cell wall of C. neoformans from its capsule, 25 μg/ml Fluostain I (Sigma-Aldrich) was added with the secondary Ab. Samples were then incubated at 37°C for 30 min. Prior studies have established that the immunofluoresence (IF) pattern is the same regardless of whether one uses FITC-labeled primary or secondary Ab (31). The cells were collected by centrifugation and washed with PBS between the applications of reagent. Then, 30 μl of mounting medium (0.1 M n-propyl gallate–50% glycerol in PBS; Sigma-Aldrich) was added. Finally, 5–10 μl of this suspension was added to Poly-Prep slides (Sigma-Aldrich) and coverslips were placed. The slides were viewed with an Olympus AX70 microscope equipped with FITC and DAPI filters. Images were recorded by a Retiga 1300 digital CCD camera using the QCapture 2 software for real time image preview and capture (QIMAGING). A Ph.D.-12 Phage Display Peptide Library was obtained from New England Biolabs with a concentration of 1.5 × 1013 PFU/ml and a complexity of 2.7 × 109 transformants. The biopanning protocol followed the manufacturer’s instruction and involved incubating the library on a 6-well plate (BD Biosciences) coated with the affinity-purified target mAb (25 μg/ml in carbonate buffer, pH 8.7), washing away the unbound phage and eluting the bound phage. The eluted phage was then amplified and taken through additional cycles of biopaning and amplification to enrich for the phages with the highest affinity. After three rounds of screening, three individual clones were selected, amplified, and characterized by a capture ELISA with the target anti-GXM mAb 3E5 IgG3, as coating Ab. The library was absorbed against plastic-binding phages by incubating the amplified phages onto a 6-well plate and recovering the unbound phages. The individual clones were selected by luminescence screening assay using the Super Signal West Pico Chemiluminescent Substrate from Pierce. A capture ELISA was used to confirm positive phage clones as described by the instructions of the peptide library kit with minor modifications. Briefly, the supernatant of the amplified culture of each clone was used as a testing sample. Polystyrene plates were coated with ∼1 × 1011 PFU/ml phage (UV inactivated) followed by blocking with 1% BSA in TBS. mAbs were added in serial dilutions starting at 50 μg/ml in 1% BSA in TBS. Plates were incubated for 1 h at 37°C and specific binding was detected using phosphatase conjugated goat anti-mouse κ Ab (Southern Biotechnology). Plates were washed with TBS-0.5% Tween 20 between steps. The binding reactivity between 3E5 mAbs and the selected phage clones was evaluated by OD at 405 nm after addition of substrate. DNA from selected clones was isolated using the QIAprep spin M13 kit (Qiagen) and then sequenced (DNA Sequencing Facility, Albert Einstein College of Medicine). Based on the sequence of the inserts of two phage, peptides were synthesized and biotinylated by the Laboratory for Macromolecular Analysis at Albert Einstein College of Medicine. These biotinylated peptides were tested for their reactivity with the 3E5 switch variants by a peptide ELISA as described above. Polystyrene plates were coated with a 1 μg/ml solution of GXM in PBS followed by blocking with 1% BSA in TBS. Peptides were added in serial dilutions starting at a concentration of 20 μg/ml. An irrelevant peptide was used as a negative control (data not shown). 3E5 mAbs were added at a constant concentration of 10 μg/ml. Plates were incubated for 1 h at 37°C and specific binding was detected using phosphatase conjugated goat anti-mouse κ Ab (Southern Biotechnology). The plates were then developed by adding substrate and determining OD at 405 nm. The 3E5 IgG1 and IgG3 VH and VL nucleotide sequences have been previously reported based on direct mRNA sequencing (12). The 3E5 VH and VL sequences reported here are identical to the ones reported previously. These 3E5 family V region sequences are deposited in GenBank under accession numbers AY674872, AY674873, AY674874, AY674875, AY674876, AY674877, and AY679102. The 4H3 family V region sequences are deposited in GenBank under accession numbers AY679096, AY679097, AY679098, AY679099, AY679100, and AY679101. These 4H3 VH and VL region sequences reported are also identical. GXM binding of the different isotype switch variants from the mAb 3E5 and 4H3 families revealed different binding curves for some of the isotypes (Fig. 1⇓). Because all of the switch variants have identical VH and VL regions, the binding curves were expected to be similar, if not identical. Although there were differences in mAb 3E5 IgG subclass binding to GXM (Fig. 1⇓A), these were relatively small and could potentially be explained by differences in avidity as has been suggested previously (32). However, significantly larger differences in GXM binding were detected with the 4H3 switch variants, with the relative order of reactivity being IgG3 > IgG1 > IgG2b (Fig. 1⇓B). This finding suggested that the C region can affect the fine specificity of distinct V regions, albeit in different ways. However, we are unable to rule out the possibility that these results are due to avidity differences of the Abs. Hence, we investigated reactivity with chemically de-O-acetylated GXM. Most protective Abs lose reactivity with GXM when the polysaccharide is chemically de-O-acetylated (33). Consistent with this observation the nonprotective 3E5 IgG3 bound to the modified GXM roughly 10 times more strongly than the other 3E5 Abs, and their relative strength of binding was IgG3 ≫ IgG1, IgG2a > IgG2b (Fig. 1⇓C). All of the 4H3 switch variants bound to de-O-acetylated GXM, with the relative affinities being IgG3 > IgG1 > IgG2b (Fig. 1⇓D), consistent with the finding that 4H3 mAbs do not prolong the life of infected animals (15). The ability of 3E5 IgG3 to bind the de-O-acetylated GXM with a higher affinity was surprising given that de-O-acetylation of GXM usually results in loss of binding of mAbs with identical V regions (13). This finding suggests that the C region may not only affect the relative fine specificities of V-region-identical isotype switch families, but may also allow IgG Abs of different subclasses but encoded by the same V region, to recognize different epitopes. Although it seemed less likely, an explanation for these results based on differences in avidity cannot be formally excluded. Binding of 3E5 and 4H3 families of isotype switch variants to GXM by ELISA. Reactivity of 3E5 switch variants to GXM-D (A) and to de-O-acetylated GXM-D (C) immobilized on polystyrene plates. Binding of the 4H3 family of switch variants to GXM-D (B) and to de-O-acetylated GXM-D (D) immobilized on polystyrene plates. Points represent the average of three measurements, and brackets denote the SD. The details of each ELISA are diagrammed in the inset of each panel. To investigate whether the phenomenon of isotype-related changes in apparent specificity extended to non-GXM epitopes we assayed the binding of our 3E5 and 4H3 isotype switch families on additional unrelated Ags. The KLH is a highly glycosylated protein that is widely used as an immunologic carrier (34, 35, 36, 37). Haptenic macromolecules have been conjugated to KLH using gluteraldehyde (25). KLH-g contains an epitope that has antigenic mimicry to a number of carbohydrate Ags including GXM (27). As observed with GXM, V region-identical Abs with different IgG C regions demonstrated differences in the relative strength of binding to KLH-g, which followed the order IgG1 ≫ IgG2b, IgG3 > IgG2a for the 3E5 set (Fig. 2⇓A) and IgG1 > IgG2b, IgG3 for the 4H3 set (Fig. 2⇓B). KLH-p destroys terminal glycol residues. Because Abs to polysaccharides often bind terminal sugar structures (38), periodate can selectively destroy the antigenicity of the surface carbohydrate molecules without affecting protein determinants or some of the internal carbohydrates (39). Although the mAbs in the 3E5 and 4H3 sets had lower affinity for KLH-p relative to KLH, significant variability between the different isotypes of each set was still apparent, with the relative strength in binding being IgG1 > IgG3 > IgG2a > IgG2b for 3E5 (Fig. 2⇓C) and IgG1 > IgG2b > IgG3 for 4H3 (Fig. 2⇓D). When comparing the binding of these Abs to KLH-g, KLH-p, and GXM, a clear shift in the highest binding isotype is apparent. Hence, for any given family of switch variants, the relative affinities of the isotype switch variants can shift, depending on the Ag. Binding of 3E5 and 4H3 families of isotype switch variants to KLH by ELISA. Binding of 3E5 isotype switch variants to KLH-g (A) and KLH-p (C) immobilized on polystyrene plates. Binding of 4H3 isotype switch variants binding to KLH-g (B) and KLH-p (D) immobilized on polystyrene plates. Points represent the average of three measurements, and brackets denote the SD. The details of each ELISA are diagrammed in the inset of each panel. Ab competition experiments were done to further explore potential specificity differences between the various 3E5 and 4H3 isotypes. Abs that compete for binding may either recognize the same epitope, or bind to closely spaced epitopes and compete as a result of steric interference. However, when there is no competition between Abs one can conclude that they bind to different epitopes. We analyzed the ability of the 3E5 isotypes to compete with additional mAbs to GXM. mAb 12A1 (IgM) is also a member of the group II GXM-specific Abs, and is encoded by the same V region genes as the 3E5 switch variants, unlike 4H3. Although neither 4H3 IgG1 nor 4H3 IgG3 could compete with 3E5 for binding, as one would expect from Abs encoded by different V regions (data not shown), each of the 3E5 isotype switch variants competed with mAb12A1 (Fig. 3⇓A), but demonstrated slight variations in their relative ability to inhibit the binding in the order IgG2b > IgG3 > IgG2a > IgG1. A, Competition binding assay between 3E5 mAbs to bound-GXM in competition with mAb12A1 (IgM). Reactivity of 3E5 mAbs with the biotin-labeled anti-idiotypic mAb 6A10 (B) by ELISA, after normalization of concentration for isotype-related differences in binding to the polystyrene microtiter plate. Points represent the average of three measurements, and brackets denote the SD. The details of each ELISA are diagrammed in the inset of each panel. To examine whether the IgG subclass affects the 3E5 Id, we studied the reactivity of the 3E5 variants for an anti-idiotypic mAb known as 6A10, which was generated against the 2H1 mAb, a group II GXM-specific Ab, and interacts with both VH and VL of the Ag-combining site (21). mAb 6A10 binds the 3E5 switch variants with a relative efficacy of IgG3 ≫ IgG2b > IgG2a, IgG1 after the data obtained with mAb 6A10 was normalized for the amount of 3E5 mAb bound to the plate (Fig. 3⇑B). These results point out that different C regions can alter Id reactivity of Abs with identical V regions. Peptide mimetics of GXM bind to the Ag-combining site and can be used to probe for paratope changes that would be consistent with specificity changes. The peptides used were generated against mAb 2H1 (IgG1) and react with the binding site of mAb 3E5 (28) which uses the same family of V-region genes (17). Peptide mimetopes have proven useful in identifying small differences in fine specificity between mAbs with identical V regions (28). Each of the 3E5 isotypes showed reactivity with peptides P601E, P206.1, or PA1, but the binding curves were different consistent with differences in apparent affinity for the different peptides (Fig. 4⇓, A–C). For peptide P601 (Fig. 4⇓A), the 3E5 switch variants bound with a relative affinity of IgG3 > IgG2b, IgG1, IgG2a. For peptide P206.1 (Fig. 4⇓B), the relative affinity was IgG2b, IgG1 > IgG2a > IgG3 for mAb concentrations <1 μg/ml, and prozone-like effects were apparent in the binding curve for IgG2b, IgG1, and IgG2a at mAb concentrations >1 μg/ml. For peptide PA1 (Fig. 4⇓C), there was not much difference in binding for the various isotypes except that IgG3 produced higher signals at mAb concentrations >1 μg/ml. Reactivity of 3E5 mAbs with peptide mimetics by ELISA. Biotinylated peptides P601E (A), P206.1 (B), and PA1 (C) were immobilized onto streptavidin-coated plates. Points represent the average of three measurements, and brackets denote the SD. The details of each ELISA are diagrammed in the inset of each panel. 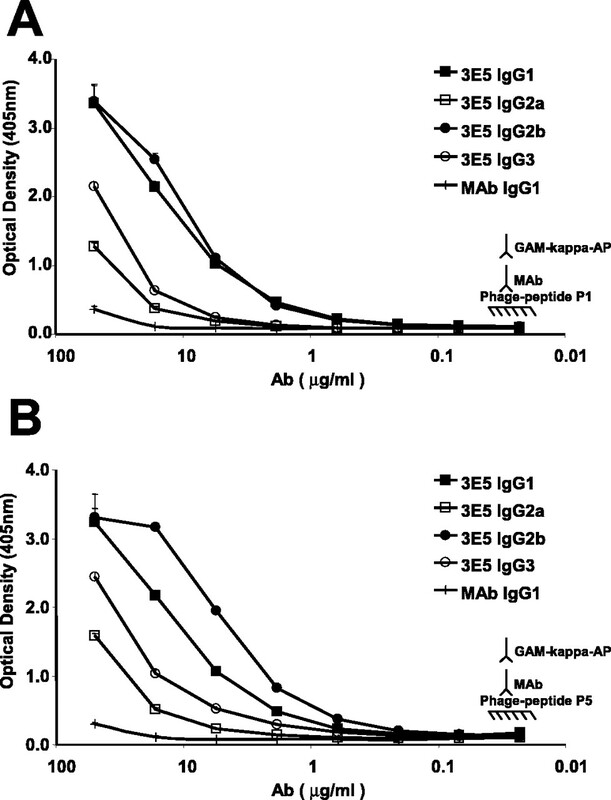 Reactivity of 3E5 mAb switch variants to phage-expressing peptides P1 (A) and P5 (B). Points represent the average of three measurements, and brackets denote the SD. The details of each ELISA are diagrammed in the inset of each panel. Reactivity of 3E5 mAbs to biotinylated peptides selected by the Ph.D. library P1 (A) and P5 (B). Competition binding assay between biotinylated peptide P1 (C) and the 3E5 family of switch variants to GXM. Points represent the average of three measurements, and brackets denote the SD. The details of each ELISA are diagrammed in the inset of each panel. Prior studies have shown that IF patterns are good indicators of Ab specificity (10, 31). Each of the 3E5 switch variants bound to C. neoformans cells in an annular binding pattern (Fig. 7⇓). However, there were subtle differences in the localization of fluorescence in the capsule for each one of the Abs. For IgG1 (Fig. 7⇓A) and IgG2a (Fig. 7⇓B) we observed a brighter outer ring and fluorescence throughout the body of the cell. For IgG2b (Fig. 7⇓C), we have an even thicker outer ring and fluorescence through out the body of the cell. For IgG3 we observe a thicker outer ring but no fluorescence on the body of the cell (Fig. 7⇓D). The IF pattern observed for the 4H3 mAbs was punctate, and less differences were apparent by this technique between the different isotypes (Fig. 8⇓). Indirect immunofluorescence of C. neoformans stained with 3E5 mAbs. 3E5 IgG1 (A), 3E5 IgG2a (B), 3E5 IgG2b (C), and 3E5 IgG3 (D). Green fluorescence represents Ab labeling against capsule, and blue fluorescence represents labeling to the cell wall of C. neoformans strain 24067. Cells shown are representative of the immunofluorescence patterns observed. Bar, 5 μm. Similar results were obtained by direct immunofluorescence using these mAbs labeled with Alexia Fluor 488 (data not shown). Indirect immunofluorescence of C. neoformans stained with 4H3 mAbs 4H3 IgG1 (A), 4H3 IgG2b (B), and 3E5 IgG3 (C). Green fluorescence represents Ab labeling against capsule and blue fluorescence represents labeling to the cell wall of C. neoformans strain 24067. Cells shown are representative of the immunofluorescence patterns observed. Bar, 5 μm. Resolving the question of whether the Ab C region contributes to specificity is of great importance for both fundamental and practical immunology. It has been long assumed that Ig C region domains do not play a significant role in the Ag-Ab interactions apart from their effects on avidity, which are mediated by Ab valency, and/or differences in hinge flexibility that affect the capacity of the Ig molecule to bind more than one epitope (40). The current view is that the primary and secondary Ab responses originate from the same B cell subset. These B cells are stimulated to undergo isotype-switching by T cell signals such that specificity is preserved as new isotypes are generated by the combination of VH and CH sequences (1). However, if the C region contributes in any way to specificity, one could imagine that isotype switching could result in Ig molecules with altered specificity despite identical V region sequences. A variety of observations ranging from isotype-related Id restriction (41, 42) to differences in Ag binding (43, 44, 45, 46) strongly suggest that the C region can influence V region molecular properties. Consistent with this view, is the suggestion for conformational signaling through the VH/CH1 interface, which would impose structural and/or kinetic constrains in the Ab-Ag-binding site (47). Crystallographic studies indicate that the amino acids within the link between the variable domain and CH1 and CL are flexible and allow spatial arrangements that facilitate the binding of Ag by Fab (48). Hence, changes in the CH domain could affect the functional affinity and specificity of Ab through a complex mechanism involving Ab flexibility and cooperative interactions in the case of Abs bound to multivalent Ags (43). These observations, together the finding that IgA, IgG1, and IgM recombinant Abs are able to bind the same epitope but had significant binding differences (46), and our recent finding that V-region-identical chimeric Abs of different isotype had differences in fine specificity, make a circumstantial, yet compelling case for the notion that the C region can influence the interaction between the paratope and the epitope. In this study we explore this possibility with two sets of V-region-identical isotype variant mAbs that bind to distinct epitopes in GXM, use different V regions, and differ in protective efficacy (14, 17). The Ag-binding properties of the 3E5 and 4H3 isotype variant sets were evaluated by ELISA using native and modified GXM, modified KLH, anti-Id mAbs, and peptide mimetics. In addition we conducted competition studies with other GXM-binding mAbs and IF studies on C. neoformans cells. Each of these assays showed differences in binding for each of the two families of V-region-identical mAbs. The finding that the 3E5 family of switch variants manifest different efficacy in competition with other mAbs also suggests isotype-related differences in specificity. However, it is noteworthy that C region-associated differences in specificity were not sufficient to alter the binding of either the 3E5 or 4H3 switch variants sufficiently such that one would compete with one another. Although for each assay it is conceivable to imagine that some of the differences in relative binding of the two families of switch variants are due to avidity for the Ags used, this explanation is difficult to reconcile with the finding that the different isotypes did not show the same relative binding for the different Ags analyzed. In this regard, murine IgG3 was shown to have higher apparent affinity for polysaccharides than other IgG subclasses, presumably as a result of increased avidity resulting from constant-region mediated polymerization after Ag binding (14, 49). If avidity were solely responsible for our observations, one might have expected IgG3 to consistently be the strongest binding isotype for those experiments that involved binding to polyvalent Ags, such as GXM and KLH. However, the data presented here shows that this was not the case. Differences in avidity cannot account for differences in binding to Ags with only one epitope such as peptides or to Ags that express either one epitope or are not polyvalent. For these Ags, the expectation was that the binding curves resulting from V-region-identical Abs would be identical, because only one Fab is expected to interact with the Ag. This is consistent with the findings by Pritsch and colleagues (46, 47) that monomeric IgA and IgA Fab display the same binding affinities. Furthermore, the MALDI-TOF mass spectrometry revealed no evidence for the formation of bimolecular or higher order complexes in the IgG isotype preparations, consequently we can exclude Ig aggregation as an explanation for our findings. In fact, the most straightforward interpretation of the data is that despite having the same primary structure, fine specificity of V-region-identical binding sites changes as they are expressed with different C regions. Interestingly, the observation that the relative binding affinity between the isotypes changes depending on the Ag, suggests that the C region is not simply affecting the ability of the Ab to bind as a whole, but rather changing the fine specificity for particular Ags. A potential mechanism for this effect could involve isotype-related differences in the ability of V region-identical Abs to undergo adapted fit transitions upon interacting with different Ags. In this regard, a single Ab has been shown to bind different Ags as a function of V region structural transitions (50). Alternatively, the C region could confer a conformational change on the V region and its Ag-binding site. It is worth noting that the crystal structure of the 2H1 Ab with the PA1 peptide in its binding site was not different than without the peptide there, suggesting that this site is not easily changed at least by Ag binding (51). Furthermore, it is noteworthy that both isotype switching and somatic hypermutation share common molecular mechanisms, that can affect both apparent affinity and specificity, suggesting the possibility that these processes have synergistic effects in diversifying the Ab response. We generated two new peptide mimetics of GXM by selecting a phage-display library with 3E5 isotypes. One peptide mimetic to which the mAbs 3E5 bound with a much stronger affinity had the motif WM that was identified in a prior study as common to many class II Ab-binding peptides (29). The other peptide had a sequence with no homology to previously identified GXM peptide mimetics. Peptide mimetics of class II mAbs bind in the Ab combining site and are useful in mapping the epitope specificities of closely related mAbs (29). The availability of a family of switch variants, with identical V region sequences, provides the opportunity to ascertain whether different isotypes have an effect in peptide and binding patterns specificities. Crystallographic studies of a class II mAb with a peptide mimetic in the binding grove revealed that the peptide interacts with only a few residues in the paratope (28, 51). Consequently, differences in binding of peptide mimetics for V-region-identical isotype switch variants must imply differences in the binding site structure resulting from the association of the V region with different C regions. Anti-idiotypic Abs provide another means to study the influence of H chain C region on V region structure. The anti-idiotypic mAb 6A10 bound to the 3E5 mAbs with different reactivity, implying differences in the secondary structure of the V region protein chains. This observation is consistent with a variety of studies of Ag-stimulated B cells, which show that V regions that have similar, if not identical, Ag-binding specificity, do not necessarily share idiotypic determinants when associated with different H chains (9, 12). The finding that there is altered Id reactivity among the 3E5 mAb switch variants is consistent with, and supports, an explanation for the isotype-related differences in fine specificity involving V region structural differences that depended on the associated C region. Prior studies using the 3E5 and 4H3 isotype variant sets have shown large isotype-related differences in the protective efficacy against C. neoformans in murine models of cryptoccocal infection (12, 15). The interpretation of those results assumed that V-region-identical Abs differing in isotype implied identical specificity and concluded that isotype was a critical parameter of Ab-mediated protection against C. neoformans through Fc-related properties, which included interaction with different FcR. The finding that 3E5 IgG3 also bound in an annular pattern supported this idea. Clearly, the results showing isotype-related differences in specificity indicate that this conclusion cannot be simply made by comparing the relative protective efficacy of isotype variants in one host, because changes in fine specificity may affect Ab efficacy. However, the observation that 3E5 IgG1 is protective in normal mice and not protective in CD4-deficient mice, combined with the finding that 3E5 IgG3 is not protective in normal mice but protective in CD8-deficient mice (12, 16) imply dependence of protective efficacy on isotype independent of any effects the C region may have on V region structure. It is noteworthy that when the 3E5 and 4H3 families were initially characterized (11, 19) we did not detect a significant difference in binding to GXM but those experiments used much higher Ab concentrations where binding differences are not apparent. In summary, we observed changes in reactivity to GXM, peptide mimetopes, and anti-Id MAbs when the IgG3 3E5 mAb is switched to IgG1, IgG2a, and IgG2b. For each one of these Abs, the changes in fine specificity could be different; it may reflect changes or altered Fab structure, or differences in Ig surface properties (48, 52). It has been suggested that the CH1 domain of the H chain could influence the structure of the Ab-binding site to form a more stable Ab-Ag complex (47). The current study supports the idea that the H chain C domains influence the V region differences in Ab function and specificity (10, 43, 47, 53), and reveals a complex relationship between epitope specificity and isotype. The ability of C region type to influence V region structure has major implications for such central immunological concepts as the generation of diversity and the idiotypic regulation of immune responses. If isotype switching alters specificity and Id, then idiotypic network regulation would vary depending on the isotype expressed, a finding for which there is already experimental evidence in the literature (5, 7, 8, 9, 10, 40, 54). The observation that isotype can alter fine specificity suggests a congruence in function between Ig class switching and somatic mutation, two mechanisms that rely on common molecular machinery. However, it is noteworthy that the changes in specificity associated with class switching are relatively minor and could represent a mechanism for broadening the reach of specificity of an immune response, without incurring the price of Ig loss associated with somatic mutation. Furthermore, it is conceivable that subtle alterations in specificity accompanying isotype switching serve a protective function for the host by reducing the likelihood of prozone-like effects (55) as increasing amounts of Ig are produced during an immune response. From a practical perspective, the findings that isotype can influence the fine specificity should be an important consideration in the development of genetically engineered Abs for therapeutic use because it is conceivable that humanization techniques or the synthesis of mouse-human chimeric Abs can alter the fine specificity of the original Ab. ↵1 A.C. is supported by the National Institutes of Health Grants AI03342, AI033774, AI052733, and HL059842. ↵2 M.T. and R.M. contributed equally. ↵4 Abbreviations used in this paper: GXM, glucuronoxylomannan; IF, immunofluoresence; KLH, keyhole limpet hemocyanin; KLH-g, gluteraldehyde-treated KLH; KLH-p, periodate-treated KLH. Lieber, M.. 2000. Antibody diversity: a link between switching and hypermutation. Curr. Biol. 10:R798. Li, Z., C. J. Woo, M. D. Iglesias-Ussel, D. Ronai, M. D. Scharff. 2004. The generation of antibody diversity through somatic hypermutation and class switch recombination. Genes Dev. 18:1. Amit, A. G., R. A. Mariuzza, S. E. Phillips, R. J. Poljak. 1986. Three-dimensional structure of an antigen-antibody complex at 2.8 Å resolution. Science 233:747. Feng, J. Q., K. Mozdzanowska, W. Gerhard. 2002. Complement component C1q enhances the biological activity of influenza virus hemagglutinin-specific antibodies depending on their fine antigen specificity and heavy-chain isotype. J. Virol. 76:1369.
Cooper, L. J., A. R. Shikhman, D. D. Glass, D. Kangisser, M. W. Cunningham, N. S. Greenspan. 1993. Role of heavy chain constant domains in antibody-antigen interaction: apparent specificity differences among streptococcal IgG antibodies expressing identical variable domains. J. Immunol. 150:2231. Reitan, S. K., K. Hannestad. 1995. A syngeneic idiotype is immunogenic when borne by IgM but tolerogenic when joined to IgG. Eur. J. Immunol. 25:1601. Reitan, S. K., K. Hannestad. 2001. The primary IgM antibody repertoire: a source of potent idiotype immunogens. Eur. J. Immunol. 31:2143. Morse, H. C., III, M. E. Neiders, R. Lieberman, A. R. Lawton, III, R. Asofsky. 1977. Murine plasma cells secreting more than one class of immunoglobulin heavy chain. II. SAMM 368–a plasmacytoma secreting IgG2b-κ and IgA-κ immunoglobulins which do not share idiotypic determinants. J. Immunol. 118:1682. Nishinarita, S., J. L. Claflin, R. Lieberman. 1985. IgA isotype-restricted idiotypes associated with T15 Id+ PC antibodies. J. Immunol. 134:2544. McLean, G. R., M. Torres, N. Elguezabal, A. Nakouzi, A. Casadevall. 2002. Isotype can affect the fine specificity of an antibody for a polysaccharide antigen. J. Immunol. 169:1379. Casadevall, A., M. D. Scharff. 1991. The mouse antibody response to infection with Cryptococcus neoformans: VH and VL usage in polysaccharide binding antibodies. J. Exp. Med. 174:151. Yuan, R., A. Casadevall, G. Spira, M. D. Scharff. 1995. Isotype switching from IgG3 to IgG1 converts a nonprotective murine antibody to Cryptococcus neoformans into a protective antibody. J. Immunol. 154:1810. Casadevall, A., J. Mukherjee, S. J. Devi, R. Schneerson, J. B. Robbins, M. D. Scharff. 1992. Antibodies elicited by a Cryptococcus neoformans-tetanus toxoid conjugate vaccine have the same specificity as those elicited in infection. J. Infect. Dis. 165:1086. Nussbaum, G., R. Yuan, A. Casadevall, M. D. Scharff. 1996. Immunoglobulin G3 blocking antibodies to the fungal pathogen Cryptococcus neoformans. J. Exp. Med. 183:1905. Yuan, R. R., G. Spira, J. Oh, M. Paizi, A. Casadevall, M. D. Scharff. 1998. Isotype switching increases efficacy of antibody protection against Cryptococcus neoformans infection in mice. Infect. Immun. 66:1057. Yuan, R., A. Casadevall, J. Oh, M. D. Scharff. 1997. T cells cooperate with passive antibody to modify Cryptococcus neoformans infection in mice. Proc. Natl. Acad. Sci. USA 94:2483. Mukherjee, J., A. Casadevall, M. D. Scharff. 1993. Molecular characterization of the humoral responses to Cryptococcus neoformans infection and glucuronoxylomannan-tetanus toxoid conjugate immunization. J. Exp. Med. 177:1105. Mukherjee, J., M. D. Scharff, A. Casadevall. 1992. Protective murine monoclonal antibodies to Cryptococcus neoformans. Infect. Immun. 60:4534. Spira, G., M. D. Scharff. 1992. Identification of rare immunoglobulin switch variants using the ELISA spot assay. J. Immunol. Methods 148:121. Casadevall, A., M. DeShaw, M. Fan, F. Dromer, T. R. Kozel, L. A. Pirofski. 1994. Molecular and idiotypic analysis of antibodies to Cryptococcus neoformans glucuronoxylomannan. Infect. Immun. 62:3864. Nussbaum, G., S. Anandasabapathy, J. Mukherjee, M. Fan, A. Casadevall, M. D. Scharff. 1999. 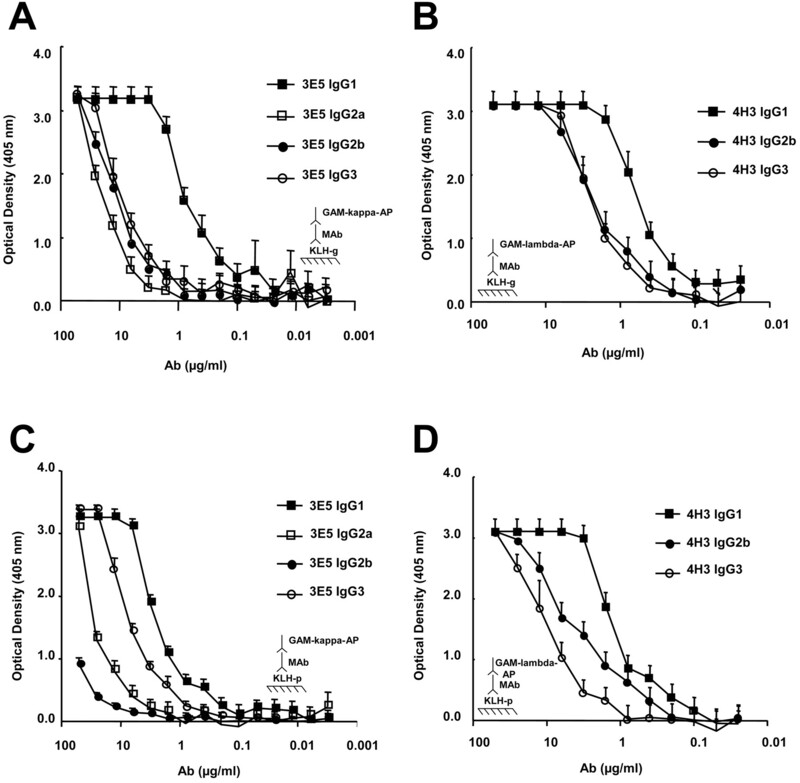 Molecular and idiotypic analyses of the antibody response to Cryptococcus neoformans glucuronoxylomannan-protein conjugate vaccine in autoimmune and nonautoimmune mice. Infect. Immun. 67:4469. Dattamajumdar, A. K., D. P. Jacobson, L. E. Hood, G. E. Osman. 1996. Rapid cloning of any rearranged mouse immunoglobulin variable genes. Immunogenetics 43:141. Cherniak, R., L. C. Morris, B. C. Anderson, S. A. Meyer. 1991. Facilitated isolation, purification, and analysis of glucuronoxylomannan of Cryptococcus neoformans. Infect. Immun. 59:59. Kozel, T. R.. 1983. Dissociation of a hydrophobic surface from phagocytosis of encapsulated and non-encapsulated cryptococcus neoformans. Infect. Immun. 39:1214. Zegers, N., K. Gerritse, C. Deen, W. Boersma, E. Claassen. 1990. An improved conjugation method for controlled covalent coupling of synthetic peptides to proteins using glutaraldehyde in a dialysis method. J. Immunol. Methods 130:195. Hamilton, J. V., P. L. Chiodini, P. G. Fallon, M. J. Doenhoff. 1999. Periodate-sensitive immunological cross-reactivity between keyhole limpet haemocyanin (KLH) and serodiagnostic Schistosoma mansoni egg antigens. Parasitology 118:83. May, R. J., D. O. Beenhouwer, M. D. Scharff. 2003. Antibodies to keyhole limpet hemocyanin cross-react with an epitope on the polysaccharide capsule of Cryptococcus neoformans and other carbohydrates: implications for vaccine development. J. Immunol. 171:4905. Valadon, P., G. Nussbaum, L. F. Boyd, D. H. Margulies, M. D. Scharff. 1996. Peptide libraries define the fine specificity of anti-polysaccharide antibodies to Cryptococcus neoformans. J. Mol. Biol. 261:11. Valadon, P., G. Nussbaum, J. Oh, M. D. Scharff. 1998. Aspects of antigen mimicry revealed by immunization with a peptide mimetic of Cryptococcus neoformans polysaccharide. J. Immunol. 161:1829. Beenhouwer, D. O., R. J. May, P. Valadon, M. D. Scharff. 2002. High affinity mimotope of the polysaccharide capsule of Cryptococcus neoformans identified from an evolutionary phage peptide library. J. Immunol. 169:6992. Feldmesser, M., J. Rivera, Y. Kress, T. R. Kozel, A. Casadevall. 2000. 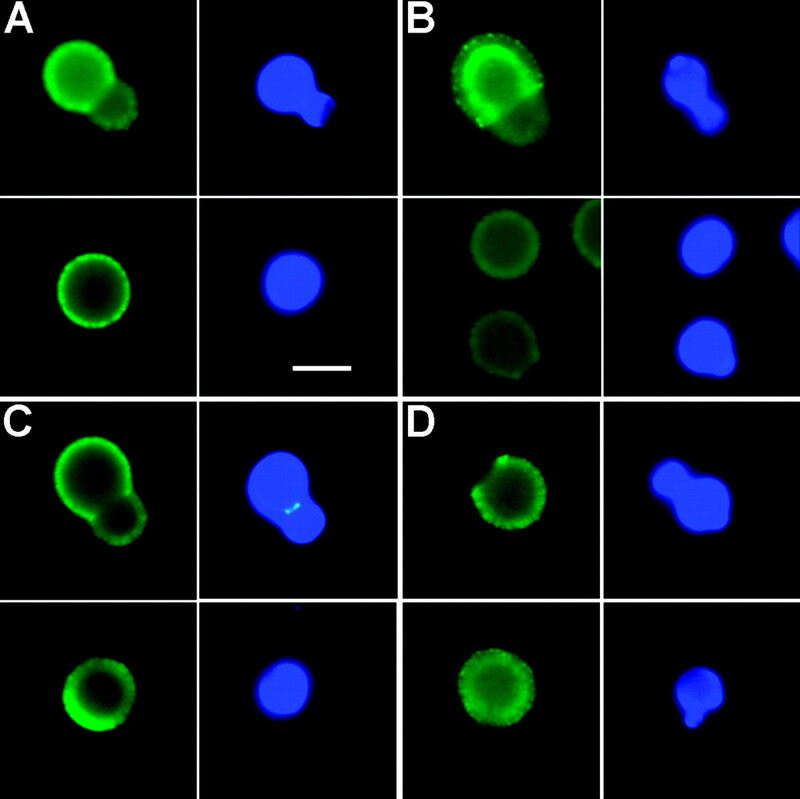 Antibody interactions with the capsule of Cryptococcus neoformans. Infect. Immun. 68:3642. Schreiber, J. R., L. J. Cooper, S. Diehn, P. A. Dahlhauser, M. F. Tosi, D. D. Glass, M. Patawaran, N. S. Greenspan. 1993. Variable region-identical monoclonal antibodies of different IgG subclass directed to Pseudomonas aeruginosa lipopolysaccharide O-specific side chain function differently. J. Infect. Dis. 167:221. Cleare, W., R. Cherniak, A. Casadevall. 1999. In vitro and in vivo stability of a Cryptococcus neoformans [corrected] glucuronoxylomannan epitope that elicits protective antibodies. Infect. Immun. 67:3096. Kwak, L. W., H. A. Young, R. W. Pennington, S. D. Weeks. 1996. Vaccination with syngeneic, lymphoma-derived immunoglobulin idiotype combined with granulocyte/macrophage colony-stimulating factor primes mice for a protective T-cell response. Proc. Natl. Acad. Sci. USA 93:10972. Dangl, J. L., T. G. Wensel, S. L. Morrison, L. Stryer, L. A. Herzenberg, V. T. Oi. 1988. Segmental flexibility and complement fixation of genetically engineered chimeric human, rabbit and mouse antibodies. EMBO J. 7:1989. Timmerman, J. M., R. Levy. 2000. Linkage of foreign carrier protein to a self-tumor antigen enhances the immunogenicity of a pulsed dendritic cell vaccine. J. Immunol. 164:4797. Harris, S. L., M. K. Park, M. H. Nahm, B. Diamond. 2000. Peptide mimic of phosphorylcholine, a dominant epitope found on Streptococcus pneumoniae. Infect. Immun. 68:5778. Kabat, E. A.. 1976. Structure of antibody combining sites. Ann. Immunol. 127:239. Woodward, M. P., W. W. Young, Jr, R. A. Bloodgood. 1985. Detection of monoclonal antibodies specific for carbohydrate epitopes using periodate oxidation. J. Immunol. Methods 78:143. Greenspan, N. S.. 2001. Dimensions of antigen recognition and levels of immunological specificity. Adv. Cancer Res. 80:147. Greenspan, N. S., J. M. Davie. 1985. Analysis of idiotope variability as a function of distance from the binding site for anti-streptococcal group A carbohydrate antibodies. J. Immunol. 135:1914. Greenspan, N. S., W. J. Monafo, J. M. Davie. 1987. 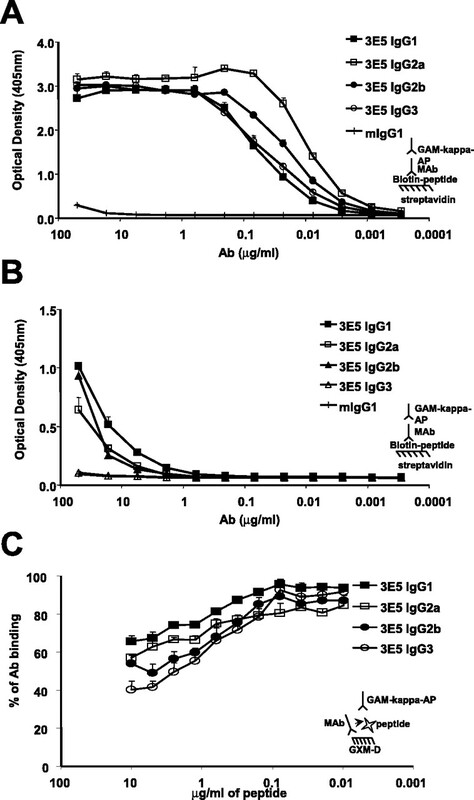 Interaction of IgG3 anti-streptococcal group A carbohydrate (GAC) antibody with streptococcal group A vaccine: enhancing and inhibiting effects of anti-GAC, anti-isotypic, and anti-idiotypic antibodies. J. Immunol. 138:285.
Cooper, L. J., J. C. Schimenti, D. D. Glass, N. S. Greenspan. 1991. H chain C domains influence the strength of binding of IgG for streptococcal group A carbohydrate. J. Immunol. 146:2659. Greenspan, N. S., R. J. Fulton, J. M. Davie. 1986. Analysis of anti-streptococcal group A carbohydrate idiotope levels in sera: correlation of magnitude of expression with idiotope position and VK haplotype. J. Immunol. 137:228. Lobo, P. I., H. C. Patel. 1997. Murine monoclonal IgG antibodies: differences in their IgG isotypes can affect the antibody effector activity when using human cells. Immunol. Cell Biol. 75:267. Pritsch, O., C. Magnac, G. Dumas, J. P. Bouvet, P. Alzari, G. Dighiero. 2000. Can isotype switch modulate antigen-binding affinity and influence clonal selection?. Eur. J. Immunol. 30:3387. Pritsch, O., G. Hudry-Clergeon, M. Buckle, Y. Petillot, J. P. Bouvet, J. Gagnon, G. Dighiero. 1996. 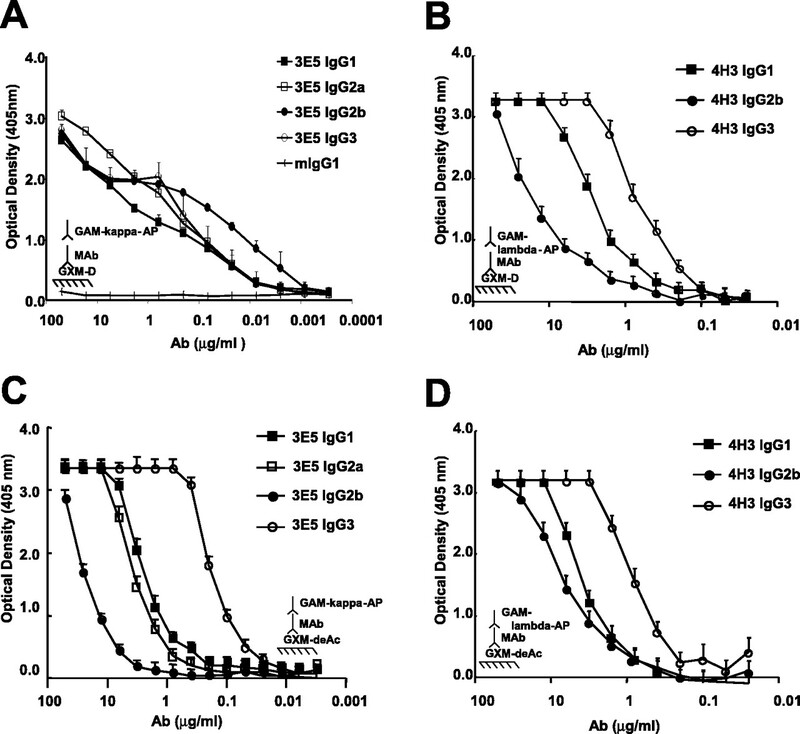 Can immunoglobulin CH1 constant region domain modulate antigen binding affinity of antibodies?. J. Clin. Invest. 98:2235. Roux, K. H., N. S. Greenspan. 1994. Monitoring the formation of soluble immune complexes composed of idiotype and anti-idiotype antibodies by electron microscopy. Mol. Immunol. 31:599. Greenspan, N. S., L. J. Cooper. 1993. Cooperative binding by mouse IgG3 antibodies: implications for functional affinity, effector function, and isotype restriction. Springer Semin. Immunopathol. 15:275. James, L. C., P. Roversi, D. S. Tawfik. 2003. Antibody multispecificity mediated by conformational diversity. Science 299:1362. Young, A. C., P. Valadon, A. Casadevall, M. D. Scharff, J. C. Sacchettini. 1997. The three-dimensional structures of a polysaccharide binding antibody to Cryptococcus neoformans and its complex with a peptide from a phage display library: implications for the identification of peptide mimotopes. J. Mol. Biol. 274:622. Greenspan, N. S., L. J. Cooper. 1995. Complementarity, specificity and the nature of epitopes and paratopes in multivalent interactions. Immunol. Today 16:226. Morrison, S. L., S. B. Porter, K. R. Trinh, L. A. Wims, J. Denham, V. T. Oi. 1998. Variable region domain exchange influences the functional properties of IgG. J. Immunol. 160:2802. Lavoie, T. B., S. Mohan, C. A. Lipschultz, J. C. Grivel, Y. Li, C. R. Mainhart, L. N. Kam-Morgan, W. N. Drohan, S. J. Smith-Gill. 1999. Structural differences among monoclonal antibodies with distinct fine specificities and kinetic properties. Mol. Immunol. 36:1189. Taborda, C. P., A. Casadevall. 2001. Immunoglobulin M efficacy against Cryptococcus neoformans: mechanism, dose dependence, and prozone-like effects in passive protection experiments. J. Immunol. 166:2100.